Children’s portrait – a special theme in art. Children portrayed at different ages, surrounded by a different entourage. Portraits were created individual and group, by request or at the behest of the soul. It seems that two events led to the writing of the artist’s canvas: the acquisition of a summer house near Moscow, in the village of Khovrino, and the birth of a daughter. Is it possible to consider a coincidence the name of the picture with the name of your beloved daughter? Hardly. Tenderness, love for Varenka gradually spread to her entourage – in the village the girl spent every summer, gained numerous friends among the local children. The painting depicts a barefoot village girl. Fidget has a crafty look, a blush full cheek – recently played with peers and sat down to rest for a minute. Lack of footwear is a common thing for peasant children in the summer: in the village, children’s shoes were rare, kept safe for a “special” occasion, or until the onset of cold weather. However, the girl’s feet look clean, she’s obviously unusually long barefoot. The blonde hair of the baby is tucked away under a headscarf, she is wearing a simple cut dress, but on her neck there is a real “adult” decoration – beads. In the hands of a mischievous girl holding a doll. The toy is beautifully dressed in a jacket with a skirt – like a young lady. If the hostess took her for a walk with her, this is probably her favorite doll. The artist used a contrasting combination of dark objects of a farm with bright clothes of a little rural mischievous woman. The general dark background as if illuminates a child’s smile, from which brightens not only her face, but all around. 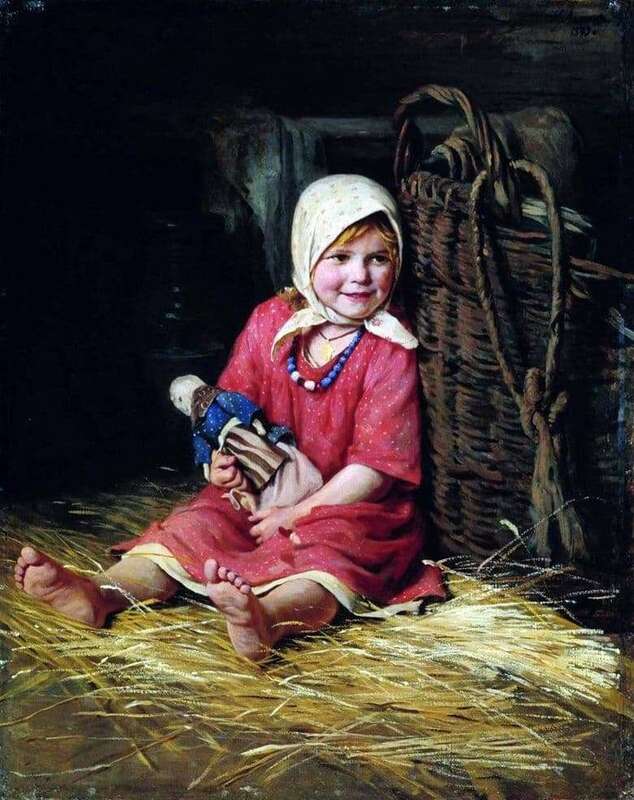 No wonder the canvas is considered one of the best children’s portraits in Russian painting. One can only guess whose portrait the painting has become. Perhaps the canvas depicts the painter’s daughter in the form of her peasant girlfriends.